Most Sunday afternoons during the winter you'll find me at the rink. 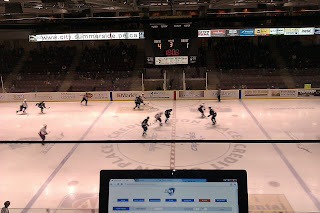 I do the website stat updates for our local Tier II Junior A hockey team, the Summerside Western Capitals of the Maritime Junior Hockey League. This year the Caps celebrated their 30th year. 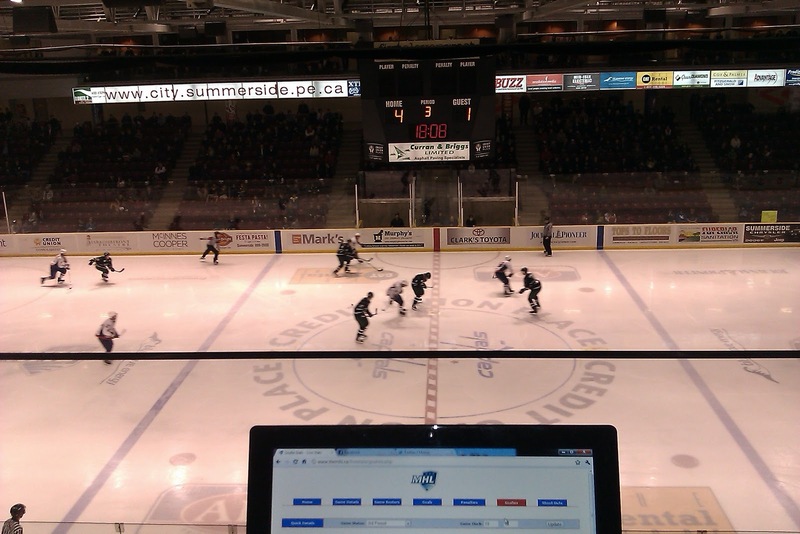 As with many small cities in Canada, the local hockey team is the lifeblood of the community. The Capitals have enjoyed significant success over their 30 year history, including a National Championship, the Royal Bank Cup, in 1997 and a return to the championship tournament again in 2009. Several former Capitals have also gone on to play in the NHL, including current Leaf Darryl Boyce, former Canadien, Ranger and Hurricane Darren Langdon, and former Washington Capital and Senator Kent Paynter. Many players have also gone on to play professional hockey in the minors. The Caps have also been coached by former NHL'ers or those that have gone on to coach at a higher level. Doug MacLean, Stanley Cup finalist with Florida, President and GM in Columbus; Dave Cameron, player with the Rockies/Devils and current coach of the St. Mike's Majors in the OHL; Gerard Gallant, former NHL player in Detroit and Tampa Bay, coach in Columbus and current head coach of the Saint John Sea Dog's in the QMJHL, and Forbie Kennedy, former NHL tough guy, have all stood behind the Caps bench. Current head coach, Gordie Dwyer, also played in the NHL with the Lightning, Rangers and Canadiens. This is a compilation of photos from the Caps first round series win (4-0) over Miramichi by Roger LeBlanc (atomic1973 on YouTube). The Caps are currently tied a one game a piece in the league semi-final against the Woodstock Slammers. It's a great way to spend an afternoon or evening and I'm looking forward to the remainder of, what Caps fans hope, is a long playoff run.